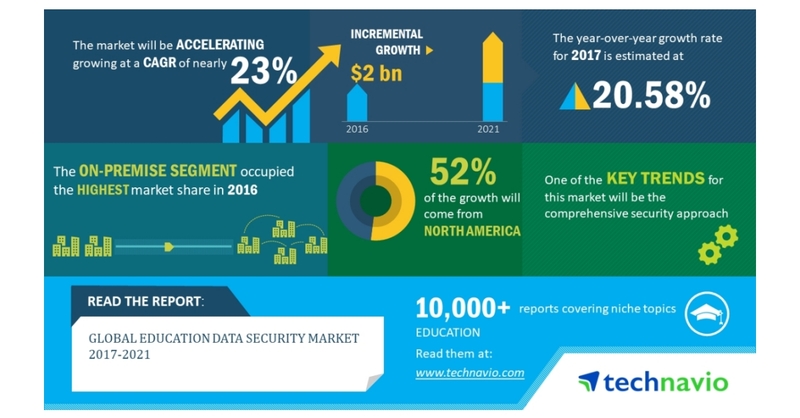 LONDON–(BUSINESS WIRE)–According to the market research report released by Technavio, the global education data security market is expected to accelerate at a CAGR of almost 23% during the forecast period. The growing reliance on digital networks is one of the key factors triggering the growth of the market. This research report titled ‘Global Education Data Security Market 2017-2021’ provides an in-depth analysis of the market in terms of revenue and emerging market trends. It also includes an up-to-date analysis and forecasts for various market segments and all geographical regions. In 2016, the on-premise segment accounted for 58% of the global market. The growth of the segment can be due to the customization options offered by these data security solutions and the advantage of developing unique security systems for institutions. The comprehensive security approach is an emerging trend in this market space. Realizing the need for cybersecurity systems, institutions are adopting dedicated measures to provide protection against security threats. These cyber security systems provide detective, preventive, and corrective controls to supervise device management, payment environment, data encryption, network infrastructure, network segregation, and real-time monitoring, in turn, providing protection against known and unknown security threats.